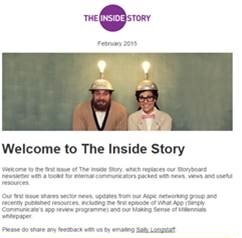 We’ve launched our new monthly newsletter – The Inside Story (February 2015 issue)! A combination of our previous newsletter (Storyboard), updates from the Association for Strategic Practitioners in Internal Communications (Aspic) and more news – to create a monthly toolkit to aid your comms. We are sharing our February 2015 issue this month, however our next issues will only be available through the mailing list. You can sign up here. Storyboard – How not to motivate and reward employees, Snow and crisis comms – do you want to build a snowman? and more. Aspic – The write-up from our ‘Talking all things mobile’ seminar. What’s new? – An App review programme, our Making Sense of Millennials whitepaper and How To guide to moving image.